Its origin is unknown, although it is virtually impossible to find it outside of Spain. It buds and matures early on, which makes it particularly sensitive to spring frosts. It is golden yellow in colour, with a characteristic aroma. Its flavour is slightly sweet due to its glycerol index that confers smoothness to its wines, which in general are of a golden hue. This is the most characteristic white grape of the southern plateau and one of the most abundant in Spain, primarily found throughout Castilla-la Mancha. In other regions it is known as Lairén, Manchega, Valdepeñera and Forcayat. It is highly productive and adapts beautifully to the extremely dry and hot Manchego climate. It produces wines with good aromas and moderate acidity, with great qualities for the production of young and traditional wines. This grape variety originated in the Burgundy wine region and it buds early on in the season, hence it is sensitive to spring frosts. This variety is one of the most highly extended throughout the world due to its capacity for adaptation. It is ideal for fermentation and aging in oak barrels. The resulting wine is powerful, fruity and with a good acidity level, wines that are harmonious and well balanced. This grape is predominantly grown in Madrid and Castilla-La Mancha within the Mondéjar Designation of Origin. Its appearance is similar to the Airén, resulting in light wines, with a touch of freshness and greater aromatic prominence than the Airén wines, with high superior alcohol content. This is a rustic plant that adapts well to almost all types of soils and climates. It has an average production rate, with late ripening and good resistance to drought. The wines, despite variations from one area to another, are fine, excellent, fruity, aromatic and pale in colour. They are wines that are easy to drink, somewhat herbaceous and fresh. Both young wines and “Generoso” wines are produced with this grape. These grapes produce excellent and very fine wines. In warm areas the resulting wines have high alcohol content, being sweet or semi-sweet and even mellow and reminiscent of liqueur. These are vigorous, highly productive plants that bud early on in the season. The resulting wines are very characteristic and appealing: aromatic (honey, orange blossom, oranges, fresh grapes and roses), fruity and fresh; with high alcohol content and full-bodied. Natural sweet wine and fortified wine (Mistela) are produced with this grape. This grape is originally from La Mancha. It is grown under the La Mancha and Manchuela Designations of Origin. The plant ripens late in the season, which means that it receives more sunlight, hence favouring the increase in sugar. It does not have a high production rate. The wines are full-bodied, with medium alcohol content, yellow in colour, low acidity level and well balanced. Young wines are produced with this grape, which contain fruity aromas. This grape variety is mainly grown in Jerez and Montilla-Moriles (80%) due to its fast evolution that favours the production of fortified “Generoso” wines. The resulting wines are of great quality. In mouth they are sweet, fruity and smooth. Both dry and sweet fortified “Generoso” wines are produced with this grape. This grape originates from the Bordeaux region of France, most likely getting its name from the combination of the French word “sauvage” (wild) and “vignon” (vine). The wines produced with this grape are elegant, dry, acidic, with high alcohol content; fresh herbaceous and floral aromas, offering many possibilities for “coupage” (blending) with other varieties. These wines can be enjoyed when young or they can be aged in wooden barrels. Due to their great aromatic level, planting of this variety is increasing considerably throughout Castilla-La Mancha. This grape is to be found in the region of Mondéjar, representing one of its traditional crops. It is less intense than other varieties, although it is ideal for blending due to its high production rate. 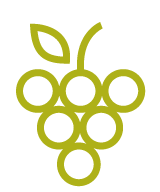 The resulting wines are not very full-bodied, rather acidic and aromatic, with this grape being perfectly suited for the production of young, fruity wines.